To take advantage of 7x24 Exchange’s special rates at the JW Marriott San Antonio Hill Country click the Hotel Reservations link below to make your reservations online, or call JW Marriott San Antonio Hill Country directly at 1-877-622-3140 and ask for the 7x24 Exchange Conference room rate of $259.00/night for a single or double, plus applicable state and local taxes. The optional daily resort fee is $25. 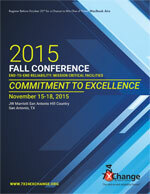 Please refer to 7x24 Exchange 2015 Fall Conference when calling. Please Note: Room reservations are available on a first come, space-available basis. Space permitting, this block will be available until October 23rd. Register for the conference and make your hotel reservations early, as the block will likely sell out. Previous 7x24 Exchange conference room blocks have sold out. 7x24 Exchange is not responsible for matching rates, finding additional rooms or providing transportation to hotels that have not been contracted by 7x24 Exchange once the block is sold out. 7x24 Exchange makes every effort to reserve the appropriate number of room nights for attendees. In the event of a sellout 7x24 Exchange will recommend nearby accommodations.